Serving Time: 9:00 a.m.-1:00 p.m.
One of the most important ways by which the ForColumbia team serves our city is through prayer (Jeremiah 29:7). In the months leading up to April 27, we have many people praying for the people in Columbia who will be impacted, our city’s government officials, our faith community, and many other related concerns. More than anything, we pray that God will be glorified as we live out His call on our lives to love and serve our neighbors (John 13:34). 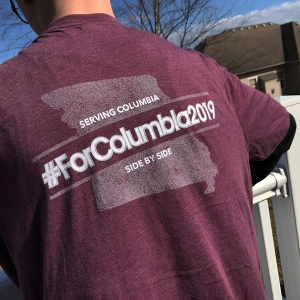 This year, we are once again hosting Prayer Hubs in each of Columbia’s six wards on the day of service, so faithful Christians can volunteer to intercede on behalf of our city and for the successful completion of ForColumbia 2019. Without God working through us, we can accomplish nothing of eternal value (John 15:5) which is why we think your day will be well spent serving at this Prayer Hub. ForColumbia prayer hub volunteers will gather together at this church site to spend approximately two hours in intermittent, guided prayer and worship, led by Prayer Hub leaders. Volunteers will be given ample suggestions for topics and multiple verses of Scripture to consider praying through. Additionally, work sites all over Columbia will be sending “live prayer requests” to the prayer hubs by way of a private website page. Following this extended time of prayer, volunteers will be encouraged to visit a nearby ForColumbia project, where they can pray with and for the volunteers and people being served. Afterwards, prayer hub volunteers will join others for lunch at a nearby lunch site. Prayer Hub volunteers are encouraged to bring a Bible. Yes, this is a great opportunity for older elementary children to pray alongside their parents.